The reviews of bespoke suits I’ve written over the years haven’t always been the same. Some included more on the experience (particularly when it was bad); some focused on the fit; others were more about style or make. Their length and depth also varied. In order to produce a consistent, in-depth reference source, therefore, over the next few months I will be looking again at every suit I have had made by a major tailor. Each will be re-photographed, in a studio with the same light, postures and angles. I will comment on my experience, particularly in wearing it since I first received it, and the quality. But the main focus will be the style: how the house cuts vary between each tailor and between each of the regional traditions. It is the aspect most readers ask about, and probably the one I have covered least in the past. This first post will be used as an introduction and reference for the rest of the series. So here are some basic points on the methodology. First, although some measurements will be taken and stated, there won’t be dozens of them. This is partly so that the pieces don’t become too numerical, and partly because measurements can sometimes be misleading. For example, the shoulder width on a jacket depends both on how far that shoulder extends over the top of the arm, and on how far the collar is cut up on the neck. It varies at both ends. 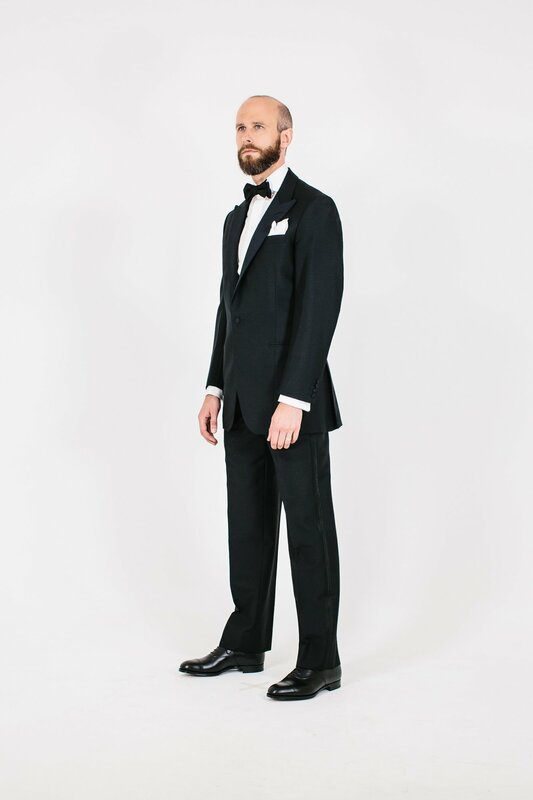 A smaller shoulder measurement doesn’t necessarily mean a narrower shoulder on the suit. Second, while these posts will contain more style detail than anything covered in Permanent Style before, it is impossible to include everything. We will select the points based on how important they are to the aesthetics and functionality of the suit, and on how much they vary between tailors. So while we might mention a technical detail such as whether the jacket has a side body or not, we won’t go a level below that and start counting stitches per inch. It would be never ending. Thirdly, the focus will be on the style of the jackets, rather than trousers or waistcoats. Trouser measurements will be mentioned, but the jacket is where most of the variation between tailors lies. And in general trouser shape and waistcoat style are more at the discretion of the customer than shoulder width, for example. Lastly, we will cover the tailors in regional batches – English, French, Neapolitan etc – in order to highlight the smaller differences between houses in each country, and avoid being blinded by the larger ones. Fortunately, most of the time when I’ve commissioned suits over the past 10 years, I have gone for the house style. Originally this was because I wanted to learn about the different houses, and was interested in their respective cuts. But as the years went on, it was also because I knew Permanent Style readers would like to see the house styles. It was about the blog, not just about me. So the pieces we show will be pretty representative. Each piece will also be discussed with the tailor, to check this is the case. Some variations between the suits are inevitable. For example, there are one or two where I only have a double-breasted jacket, not a single. But it will still be possible to compare most points, such as the shoulder padding and width, the sleevehead, the sleeve, the breast pocket, darts and so on. 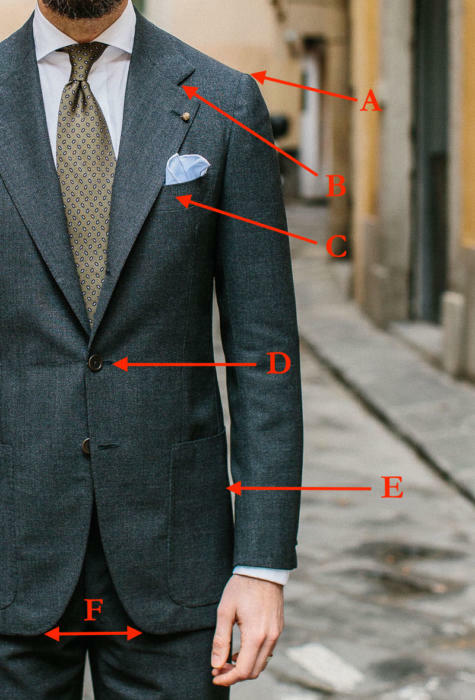 Above is a diagram that sets out some basic tailoring terms to be referenced in the pieces. It seems sensible to include it here, rather than repeat it in every article. I may add some definitions here later, if it becomes clear these are needed. The first piece, on the tuxedo I had made with Richard Anderson, will be published on Friday. I look forward to hearing what you think. You can follow the discussion on The Tailor Styles series by entering your email address in the box below. You will then receive an email every time a new comment is added. These will also contain a link to a page where you can stop the alerts, and remove all of your related data from the site. Great idea Simon. Love it! Might be an idea to include some RTW and MTM to highlight where the differences lie. Particularly considering this is an extremely useful benchmarking and referencing exercise . Hello Simon, longtime reader, first-time commenter here. Just wanted you to know I think this is an inspired idea and I’ll be very much looking forward to this series! Thank you so much for the work you do. Great idea, Simon, and a nice recap of what has happened since Day 1. Must be an exciting trip down Memory Lane for yourself, going back to all the tailors again. No doubt it will turn out an invaluable source of reference for all of us out there. Since you are confirming house cuts with the tailors anyway could you please also confirm current entry level prices? For many this will be very relevant too. Love the idea! I’m excited to see the pieces again in better angles and lighting, to be able to compare them better and to read more of your thoughts on them. Maybe these could get their own list on the site, like the cloth guide? I think that this will be a wonderful series! And I hope that it is pleasurable for you to return to previous suits and the associated memories. Don’t worry Hugh, we’ll certainly have that! Brilliant, original, and very generous initiative. Thank you for this, Simon, I look forward to seeing this very useful series of posts evolve. Will this be at the expense of other more “BAU” postings? Great idea. May I ask you who made the suit on a top of this post? Reviews are useful but can also be meaningless unless benchmarked and referenced for comparison. This new venture will certainly put things into a better perspective . I applaud this massive undertaking, it will be very valuable and interesting for us readers. A really great idea. Thank you,. Simon. Looking forward to follow this great idea. I´m sure this will turn out to include some very valuable information and source of reference for both new and old bespoke customers. Of course only in double – breasted should there be a complete overlap. However, IS there an aesthetically arguable way to describe the need for this. and or how much? Is it something you noticed yourself, or is it something that you picked up from one of the many excellent tailors you have met and dealt with? It’s a fairly important part of the style and cut, ANM. If you consider that an ‘X’ shape that begins with the width of the shoulder and sleevehead, runs through the waist, and then ends at the bottom of the quarter, is an important part of the way a jacket can flatter you, then this opening is key. As is the amount of fullness in the bottom, or skirt, of the jacket. In general, southern Italian tailors and ones aiming for a more ‘modern’ style tend to open these quarters more. Conservative tailors do so less, and think opening it up shows too much of the crotch, and perhaps the shirt above the waistband of the trouser too. 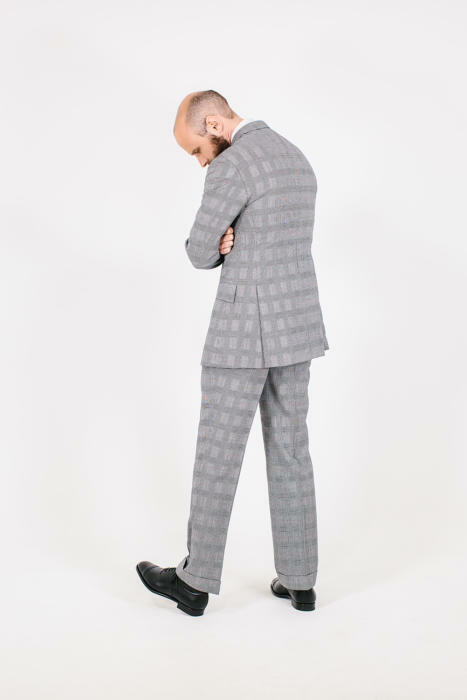 And… just as important as the opening is the shape of those quarters – the front edge below the waist button. An English tailor will have this line much straighter, a Florentine or Neapolitan more curved. Great idea! This is exactly why I read PS daily and have been for the past nine years. Thanks for sharing your experiences and knowledge Simon. You are a great resource and I appreciate your hard work and passion. It’s really this appreciation for retrospective that has set you apart from other men’s style journalists. Will you cover absolutely all of your suits, or just the ones that have seen the most constant use? Whichever the case, I – like every reader, surely – look forward to this most welcome addition to PS. Will you include your first from GB? Why not include something from GB? It’s where you (and this blog) started out and from what I can see the fit of your GB suits are no worse than the rest of your structured English suits. I wonder if it is a bit of snobbery in this, now that you have established yourself as a top of the market blogger? For many of your readers I think it would be very interesting to see how GB would compare to the rest. The fit is certainly not worse, but the make is at a lower level. I don’t think it would be fair to compare it to all the others really. I will consider it though. I’ll add my vote to wanting to see the GB suits covered. Of course its make is at a a lower level and not directly comparable to the rest, but I think that’s partly why it is of interest to me: what are the compromises when going down to that level, and how do they actually play out in terms of real life fit/look/style/durability? Overall very much looking forward to this series as I start to get close to commissioning my first bespoke jacket or suit. It still boggles me how many you’ve tried over the years. That’s gonna be lot of good reads. Cheers. Would you consider mentioning your experience with the fabric and weight?, even though it’s not overtly style-related, I think it would be good information. 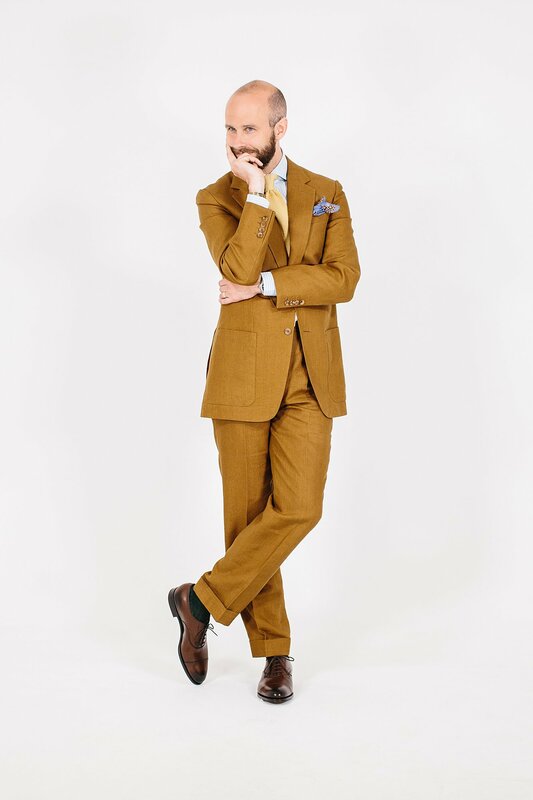 For example, how you’ve mentioned you prefer an Irish linen to and Italian one, despite the heavier weight – it would be nice to hear about the performance of the fabric too, in addition to the performance of the suit in regards to versatility, etc. will you be doing a review of Tom Sweeney in this series even though you had a jacket and trousers made rather than a suit? as i would love to hear your thoughts since your last review. We have written about that a fair bit over the years, and you’re right it’s nice because it applies to any level of suit. The points tend to be in different posts though, rather than gathered together in one. 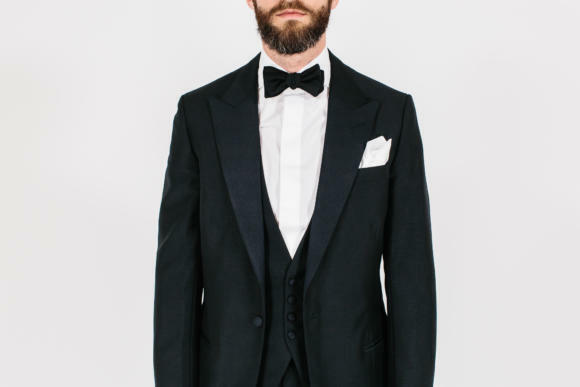 Try this post to start with and the Suit Style series. Simon, fantastic advice all round. I’m posting this here as I haven’t found a better post to pop this question on to. What is the best alternative to a wool suit? As someone who recently started to phase out any products made form animals I suddenly realised that I am due for new suits next season and if I’m not mistaken the excellent quality Austrian merino wool I usually buy suits in comes form an animal. Can cotton make the cut? Great idea Simon! Please also take note that some house cut may have modified since the time you commission the suit with the tailor. In that case, perhaps you may enlighten us with the updates on the changes. I am looking to invest in a great quality navy suit. I am suit unsure on two things. I have always been told H.Lesser is possibly the best you can get in terms of a mid weight navy. Do you agree? I am torn between patch pockets or jetts. What do you reccomend. Lessers isn’t necessarily what it used to be, and even then it may be you wouldn’t notice the difference. I’d recommend picking on weight more, from any decent mill. Could you reccomend a quality mill and also what weight cloth would you reccomend for an all year suit? Have you looked at our mills and merchants series? Don’t focus too much on mills…. And for fabrics, look at the Guide to Cloth, probably worsted suitings for your question. Simon, is it unreasonable with a bespoke jacket to expect the pattern on the back of the collar to line-up with the pattern on the back of the jacket? Could I just ask who made the grey suit, towards the end of the post, with the measurement annotations? For shoulder width, maybe measuring from sleevehead to sleevehead would have allowed for better comparisons (avoiding the distorsion from where the collar is cut up the neck). I just mention it because to me shoulder width changes the cut the most.